Split peas normally take 45 minutes to an hour of simmering before they are tender enough for soup. In this hearty, nourishing soup split peas are first ground in a blender or coffee mill. This drastically reduces their cooking time, down to as little as 10 minutes. It can be prepared whenever you need a quick, hot meal. As a matter of fact, this soup is so easy to make that even children can learn to prepare it with little or no supervision. Plus it’s absolutely scrumptious! First you need a blender or coffee mill. If you don’t have one then you can’t prepare this recipe. Blenders are one of the most useful kitchen machines one can own. Watch yard sales and thrift stores until you find one in good condition. Discount Department stores often have them inexpensively too. Better yet, ask for one as a gift for your birthday or another holiday. Measure the split peas and pour them into a blender. 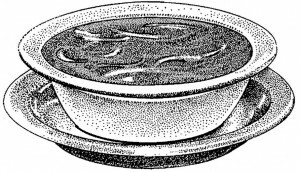 If you’re using a coffee mill then process the split peas 1/4-cup at a time. A blender can handle the whole half-cup at once. Process the split peas until they grind down into a grainy powder. This takes a full minute of blender time, sometimes up to 2 minutes. Do not try to grind more than 1/2-cup of split peas at a time. More than that is too big a load for your blender and will overheat the motor. After you turn the blender off do not remove the lid right away. Let the split pea dust settle first. If you open the blender up as soon as you’re done grinding then a big cloud of split pea dust will rise from the blender and cover everything on the counter with a light dusting of peas. It’s easily removed with a damp dishcloth but even easier to prevent in the first place. After letting the dust settle pour the split pea powder into a small sandwich bag. Add the remaining ingredients to the sandwich bag. Seal it with a twist-tie or its plastic zipper. Label the bag as suggested below and store on the pantry shelf to use as needed. Make several at once for the most time and work savings. Add 3C water & 1T margarine. In a 2-quart saucepan combine 1-packet of your Instant Split Pea Soup Mix, 3-cups of water and 1-tablespoon of margarine or vegetable oil. Stir the mixture so the split peas don’t clump up. Place the pot on the stove and bring it to a boil over high heat. Reduce the heat to medium-low and simmer for 10 to 15 minutes. When the soup is thick and the pea puree is tender it’s ready to serve. 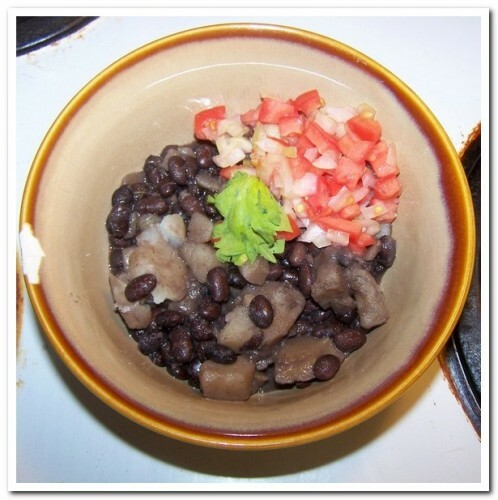 When served with toasted bread or cornbread and perhaps a glass of fruit juice, this makes a hearty meal for 1 person. It also makes 2 moderate servings that can be a nice meal with egg salad sandwiches or rice cakes plus carrot and celery sticks on the side. In the winter I especially like this soup with hot chocolate. The flavors just seem right together. Since this soup is so popular at my house, and so cheap besides, I make up 5-batches at a time which takes 1-full pound of split peas. If you have it once a week for lunch then a pound of split peas will make about a month’s supply at 30¢ to 40¢ per batch, depending on the cost of peas and margarine or oil. So you’ve got that bag of split peas that the church (food bank, WIC, mother-in-law) gave you, and now you have to do something with it. Soup seems kind of milquetoast and disturbingly green. Curried split peas might work, but then you’d have to eat it and it’s not like curry is comfort food of the highest order, also–still green. So mostly you try to ignore those split peas, hoping they’ll cook themselves one day, or maybe you can give them to someone who isn’t as well off as yourself (kind of like your MIL did.) Do not despair. I bring tidings of great joy. 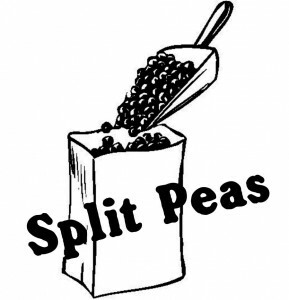 Or at least of something that makes split peas taste like anything except, well… split peas. This recipe makes split peas taste like, well… I think they taste sort of like fish sticks. No, my boys say, more like corn dogs. For what it’s worth, they don’t taste anything like split peas. So if that’s what you’re aiming for, this is the recipe that will do it. First prepare the split peas. In a medium-sized saucepan bring the peas and water to a gentle boil. Simmer for about 30 to 40 minutes or until the peas are mostly tender but not too mushy. Remove from the heat. Drain off the cooking water. if you’re feeling very thrifty you will save it for soup. Place the peas in a mixing bowl to cool. At this point you can refrigerate the peas for several hours or overnight. So if you wanted to have these for lunch then boil the peas after breakfast and set them aside until needed. When the peas are no longer hot add the milk and egg and stir until soupy. Add the flour, baking powder, salt and seasonings. Mix well to make a thick batter. Heat 1/4-cup of oil in a large skillet over medium-high heat. Drop in about 3-tablespoons of batter for each fritter. I can usually fit 4 of them in a 10-inch skillet. When the undersides are brown and crispy turn them over and brown the flip side. Transfer the cooked fritters to a plate lined with newspaper or paper towels. Add more oil to the skillet if need be and continue on until all of the batter is used. I usually get 11 fritters, but it’s supposed to make 10 to 12. I find this amount makes 3-servings. These are great as the main part of a vegetable plate including stewed tomatoes, coleslaw or green bean salad. I prefer my fritters dipped in both ketchup and mustard, like a corn dog, but they’re also good with mayonnaise or tartar sauce or even barbecue sauce.